Wong Tai Sin Temple, also known as Sik Sik Yuen Wong Tai Sin Temple (嗇色園黃大仙祠) or Red Pine Wong Tai Sin Temple (赤松黃大仙祠), is a famous shrine and tourist attraction in Hong Kong. Legend has it that Wong Tai Sin makes every wish come true upon request. It is one of the reasons why the temple attracts millions of worshippers every year. Located in Kowloon, the 18,000 m² Taoist temple is home to three religions – Taoism, Buddhism and Confucianism. The buildings of the Temple show the architectural features of traditional Chinese temples and are listed as Grade I historic buildings in Hong Kong. Wong Tai Sin, literally Great Immortal Wong, is a Chinese deity with the power of healing. He was born Wong Cho Ping in Jinhua, Zhejiang Province in the Eastern Jin Dynasty in AD 328. His family was very poor and he herded sheep at the age of 8. When he was 15 years old, he received an advice from an immortal and began to follow Taoism. According to legend, he was able to transform stones into sheep forty years later. He is also known as Red Pine Wong Tai Sin as he attained the Tao on Red Pine Mountain. Wong Tai Sin Temple had moved several times before settling down at its current place in Hong Kong. It was first established in Guangzhou in 1899 by a Taoist priest Leung Renyan. In 1915, Leung brought a sacred portrait of Wong Tai Sin to Hong Kong and set up an altar. In 1921, Pu Yi Tan, now know as Sik Sik Yuen, was found to manage the temple, and the current Wong Tai Sin Temple was finally established at Chuk Yuen Village in Kowloon. At the very beginning, Wong Tai Sin Temple used to be a private shrine and only Taoists or their family members were allowed. It was not until 1934 when the Temple began to open to the public for one day which is the Chinese New Year Day. In 1956, Wong Tai Sin Temple was approved by Hong Kong Government to fully open to the public. Since then, the Wong Tai Sin Faith has flourished in Hong Kong. The Temple is a classic of traditional Chinese architecture with red pillars, a gold roof with blue friezes, yellow latticework and multi-coloured carvings. 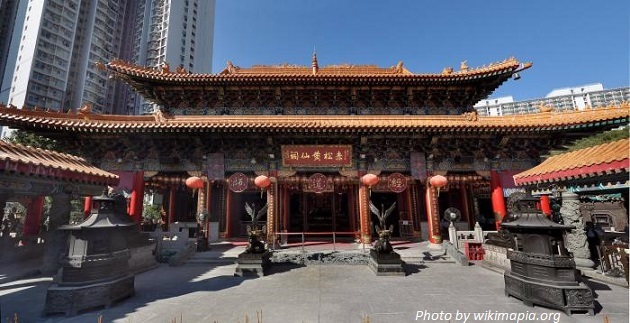 One of the most distinctive features of Wong Tai Sin Temple is its Feng Shui architectural layout with five geomantic elements: the Bronze Pavilion (metal); the Archives Hall (wood); the Yuk Yik Fountain (water); the Yue Heung Shrine (fire); and the Earth Wall (earth). Other traditional Chinese buildings include the Three Saints Hall, the Confucian Hall and the Good Wish Garden. The Temple was listed as a Grade I historic building in Hong Kong in 2010. The Main Altar is dedicated to the portrait of Wong Tai Sin, the Monkey King and the God of the Soil and the Ground; the Three-Saint Hall is dedicated to Lui Dongbun – the Taoist immortal, Kwun Yum – the Buddhist Goddess of Mercy, and Kwan Tai – the Chinese Martial God, which is a collection of three religions – Taoism, Buddhism and Confucianism. The Nine-Dragon Wall was constructed in 1981 to celebrate the 60th anniversary of the Temple and it was modelled after the one in Beihai Park in Beijing. Ten years later, Good Wish Garden was built with ponds, small bridges, and a variety of pavilions. In 2008, the Temple underwent a large-scale expansion project, including the renovation of the Main Altar, the construction of three new halls and a modern underground palace called Yuan Chen Hall (元辰殿) under the Main Altar, which houses the Goddess of the Great Dipper, Taisui and Yuenchen. The main banner of Yuan Chen Hall was written by the Hong Kong-based Chinese sinologist, Jao Tsung-I. The expansion project was completed in 2011. Wong Tai Sin Temple celebrates the birth of Master Wong Tai Sin on the 23rd day of the 8th lunar month and also the birth of Monkey King on the 16th day of the 8th month. On Chinese New Year‘s Eve, lots of worshippers flock to Wong Tai Sin Temple before midnight and try to be the first one to offer their glowing incense sticks when the year comes in order to get good fortune. Other visitors seek divine guidance through a fortune telling practice called Kau Cim (求籤). First, they pick up a bamboo cylinder containing Chinese Fortune Sticks. There are usually 100 sticks in the cylinder and each stick has a number on it. Next, they kneel in prayer, ask their questions to the deity in their heart, and shake the cylinder with both hands until a stick falls out. In case multiple sticks leave the cylinder, they do not count and the querent have to repeat the steps. The stick is then exchanged for a piece of paper, bearing the same number, with ‘answer’ on it. The ‘answers’ are usually classical allusions of the ancients in the form of literary poetry or verse. Of course you can interpret it yourself or check it online. But most believers would go to fortune telling stalls and seek advice from more than one soothsayers. Some booths offer palm reading service as well. Wong Tai Sin Temple is the first Taoist temple in Hong Kong to hold a Taoist ceremony wedding ceremony and to issue a marriage certificate with the approval of Hong Kong Government. Wong Tai Sin Fortune-telling and Oblation Arcade was visited by American TV show The Amazing Race 2. Racers had to find a specific fortune-teller so as to have a face reading and a palm reading. 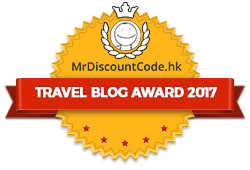 Have you ever been to Wong Tai Sin Temple? Please feel free to leave us comments or contact us if you have any questions.